Nageng Lodge at Mabalingwe - Bela-Bela Akkommodasie. Nageng lodge is an affordable lodge situated in the Mabalingwe Nature Reserve just 2 hours from Johannesburg and 28km from Bela-Bela. Nageng Lodge is the ideal family getaway for nature lovers. Spend a few days in this wildlife sanctuary set in the African bush. Rest, rejuvenate and enjoy the beauty and peacefulness of the surrounding reserve. This tranquil setting is very private and quiet. Connect with nature and enjoy the indigenous fauna and flora of the area. The Mabalingwe Nature Reserve is rich in abundant bird and animal life, including Africa's Big 5. It is spread over 12 500 ha, malaria free unspoilt bushveld. The reserve nestles in the shadow of the majestic Waterberg Mountains. The reserve includes a restaurant and ladies bar, bush pub, shop, liquor store, ATM and fuel. A large variety of activities are available including game drives, bird drives, lion feeding, archery, paintball, abseiling, tennis courts, putt-putt, squash court and horseback safaris. You are also allowed to enter the game viewing areas in your own vehicle. Nageng Lodge is the perfect private accommodation for a getaway weekend, relaxing holiday or even overnight business travellers. The lodge is a self-catering unit with fully-equipped kitchen including microwave, electric oven and stove, fridge etc. The house is comfortably furnished and includes bedding, towels, crockery, cutlery etc. The 5 bedrooms are airconditioned. Accommodates 10 adults and 2 kids under 10 years old. En-suite bedrooms each with a double bed. Loft with double bed and 2 single beds and bathroom. It has a spacious lounge fitted with an open wood fire place. Large covered patio with built-in braai. 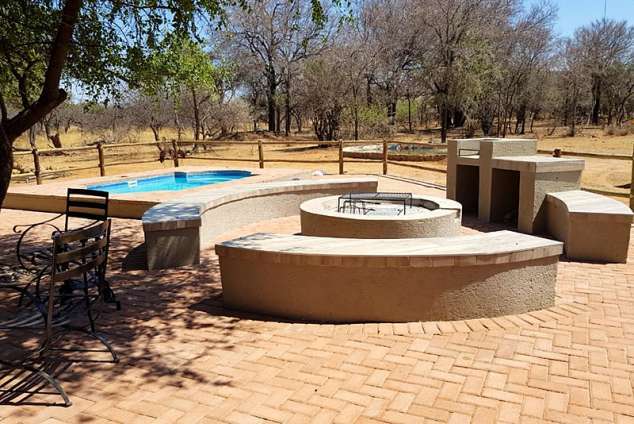 Separate boma with built-in braai and an open-pit fire place with seating. Flat screen TV with DSTV in lounge. Shaded parking for two vehicles. Enjoy wildlife roaming freely around the unit. Private watering hole which on a daily basis attracts a variety of wildlife including; Nyala, Warthogs, Impala, Zebra, Kudu, Porcupine even Rhino and Elephant just to name a few. The reserve is very safe with 24 hour security and controlled access. 159 besigtings sedert 02 Apr, 2019.